Kills adult fleas and their larvae. Prevents reinfestation. Protects long lasting 12 months protection. Breaks the flea life cycle. 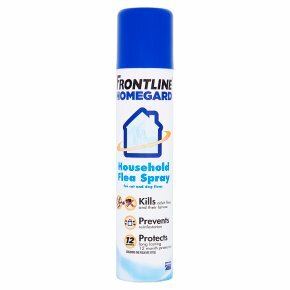 FRONTLINE HomeGard is an aerosol surface spray for use in the home and surrounding environments (carpets, cracks & crevices in flooring, animal bedding, soft upholstered furniture, car) to eradicate fleas and prevent re-infestation. FRONTLINE HomeGard Kills fleas for 6 weeks Prevents the development of flea eggs for 12 months One can covers 100 square meters (equivalent to an average 3-bedroom house) FRONTLINE HomeGard complements regular on-pet flea treatments. How to use: Remove pets and children from the area and remove/cover fish tanks prior to treatment. Ensure treated areas are well ventilated. Spray lightly from a distance of 50 cm (knee height), a 5 second burst per 2 square meter of surface. Ensure all areas are treated, including under furniture. It is recommended to do a patch test prior to use on delicate fabrics/surfaces. Use sparingly on glossy or wooden surfaces to avoid spotting. Do not re-enter area for 30 minutes after treatment or until treated areas are dry. DO NOT APPLY DIRECTLY TO ANIMALS.<br>Do not apply to clothing or human bedding. Do not contaminate foodstuffs, eating utensils or food contact surfaces. Keep away from food, drink and animal feeding stuffs.<br><br>Surface Spray.<br>Danger.<br>Extremely flammable aerosol.<br>Pressurised container: May burst if heated.<br>Harmful if swallowed or if inhaled.<br>Causes skin irritation.<br>Causes serious eye irritation.<br>May cause respiratory irritation.<br>Very toxic to aquatic life with long lasting effects.<br>Hazardous to bees.<br><br>Keep out of the reach of children.<br>Read label before use.<br><br>Protect from sunlight. Do not expose to temperatures exceeding 50°C/122°F.<br>Do not spray on an open flame or either ignition source.<br>Do not breathe mist/vapours/spray.<br>If medical advice is needed, have product container or label at hand.<br>Dispose of contents/container to an approved waste disposal plant.